* This is a parent participation program: each parent/guardian must accompany their child throughout each lesson. Dec 29, 2018-Mar 9, 2019 Note: Cold Weather Cancelation guidelines Cold weather cut-off for Bunnies is -12*C. In the event that a session is canceled, notice will be posted on the Bunnies calendar by 8:30am on Saturdays. Any “cancellation” will be posted by 8:30am., otherwise the session is running. 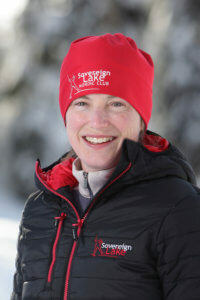 Sovereign Lake Nordic Club - meet at the 'bunny bowl' across the stadium. Favorite Trail: Jessica’s Trail…because it’s narrow like the ones I grew up learning to ski on. Why Coach? 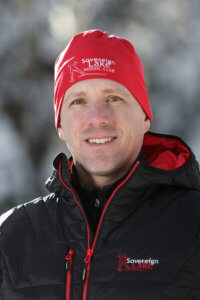 : Coaching is a great way to give back to the XC ski community that has given so much to me over the years. Words of Wisdom: Kick and glide, then let your skis do the work. Equipment : mitts, toque, buff, non-cotton long underwear, and snowsuits are appropriate for this age. Q. Where do Bunnies sessions take place ? A. Bunnies sessions start in the “Bunny Bowl” ski playground area beside the main stadium. Please ask front desk staff if directions are needed. Q. How long are Bunnies sessions? A. Bunnies program goals are achieved through short and lively one hour sessions. This allows enough time for a “formal ” session and some “free” time for independent exploring afterwards. *Note that each sessions starts a bit later than Jackrabbits and Track Attack sessions in order to allow parents to get their children to different programs and still get to Bunnies on time. Q. What skiing skills will my child learn ? A. Your child will begin learning the ready position, how to fall and rise, side step, star turn, tracking, herringbone, snowplow braking, and the first progression on diagonal stride. Q. What does a typical Bunnies session consist of ? A. Coaches use group, gentle terrain, games, songs, hoops, balls, bubbles (and the occasional juice-berry) to encourage natural learning and “discovery”. A. The formal season ends with a special Ski Tournament event. The Ski Tournament is comprised of a morning of fun including relay races, obstacle bumps, and a jungle trail. Q. What if I, a parent/guardian, am just learning to ski…how do I accompany my Bunny? A. The philosophy of the Bunnies program is to impart ski skills for both the young Bunnies and their parent who will ultimately be the one taking them skiing outside of lesson times. No worries if you are need some help getting started on skis yourself – we have “Program Parent” and “Getting Started” lessons that are designed just for you! Check with our staff to line up one of our certified instructors who can help you with your own skiing skills. Q. Will my Bunny (or I) make good progress by skiing just 1x/wk in the formal sessions? A. Every Bunny and parent progresses at their own rate. While Bunnies sessions provide a great introduction to skiing and help you get started on key ski skills and supports you along the way…you will improve quicker the more you get out and have FUN! We strongly encourage parents to take full advantage of our fantastic snow and trail system by getting out at least one other time during the week with their Bunny. A short ski following Saturday’s formal morning session works well for many families. “Bunnies” is a parent participation program: each parent/guardian must accompany their child throughout each lesson. The parent/guardian must therefore be a current SLNC member by either purchasing a season’s pass or a Parent Program Pass. You can also purchase single day passes but the Parent Programs Pass at $70 provides a great discount over purchasing day passes. You will find the Parent Programs Pass option directly below the Bunny Rabbits registration link on Zone 4. This pass is valid for Saturday use only.